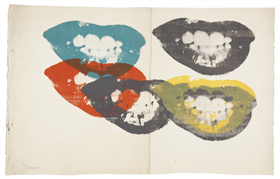 In what can best be described as the modern art-world equivalent of a garage sale, Christie’s is currently running an online auction of work by Andy Warhol (link to the catalogue… here). As would be expected, Christie’s has tapped into the cultural zeitgeist, and the very pretty micro-site features ‘Warholian Questionnaires’ with the usual suspects – ‘voice-of-her-generation’ poster-girl of the moment, Lena Dunham (creator, writer and star of Girls), Maxwell Ryan – founder of the Apartment Therapy website and author of the Big Book of Small, Cool Spaces and an online designer eyeglasses retailer. Sounds like a hipster checklist. Warhol would have approved. As for the art on offer, it’s an odd selection. The overwhelming impression is that they are clearing out the leftovers from the archive. Have a look yourself. Estimates for some works start at US$800, but many are likely to go a fair bit higher. At the time of writing, I love your kiss forever (pictured above) is up to US$26,000… (do you think it’s a coincidence that sounds like a Tracy Emin title? I think not). Lots of photos, but also some screenprints, a sculpture (yes – a can of Campbells chicken soup) and what are described as “paintings”. I use the quotation marks there because the six “paintings” are not what you would call typical. The auction runs till March 5. Christie’s has formalised a relationship with the Andy Warhol Foundation, and the proceeds from this sale are to go towards the Foundation’s projects.